Durian: possibly the worst smell on earth. A market in Siem Reap, Cambodia. I can only think that durian was first passed off as edible as a joke. Now huge forests of durian trees grow in South East Asia, and durian is regarded by many as the king of fruits. I say it is the fruit of the emperor with no clothes. It seems people sense a variety of scents, varying from sweet to revolting. I am in the latter group. 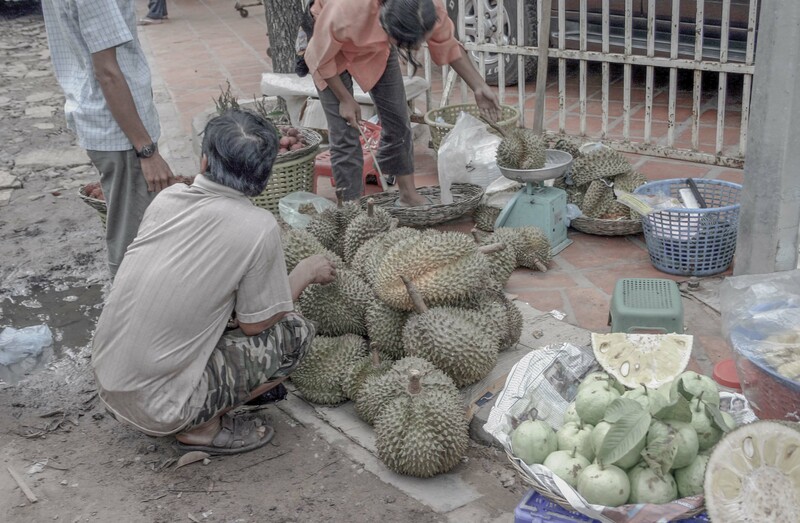 When I lived in Singapore, I couldn’t go into a grocery store if a sliced durian was for sale. The odor set off my gag reflex at the first whiff. I offer no apologies to the lovers of this odiferous fruit. I kind of like durian, but I eat it in durian ice pops. I cannot describe the taste and I’m rarely at a lack of words. I don’t like Durian as well. I can eat it but not a lot and can categorized it with oyster unfortunately. I agree about oysters too! I am totally with you on this – the smell is just unbelievable. We’ve lived in Asia for nearly 5 years now and I’m still not able to stomach the stench, never mind consider eating it. It is not something I’ll miss when we move on!